Self-driving cars and trucks are everywhere, it seems. Especially in the news. We were inundated this week with media reports about huge progress on the autonomous vehicle front. The press reported that Google — I mean Waymo — ordered “thousands” of minivans to build a fleet of autonomous vehicles that will ferry members of Waymo’s “early rider program.” The company — Alphabet’s self-driving car startup that used to be part of Google — is already ferrying passengers around a small neighborhood in Phoenix — and with no drivers in the cars. Self-driving cars are also carrying passengers in Boston, Pittsburgh and elsewhere. Even Apple reportedly expanded its experimental fleet from three to 27 vehicles. Meanwhile, the Canadian company Suncor Energy said it plans to eliminate around 400 heavy-equipment operator positions over the next six years and introduce a fleet of self-driving trucks for oil sand mining. The trucks can mine 24 hours a day, except for when they’re adding fuel. Will all this autonomous-vehicle news happening in a single week, surely self-driving cars are just around the corner, right? A Silicon Valley startup claims to be the world’s first real-world application of autonomous driving. If the claim is true, it beat Waymo, Tesla, Apple, the global car industry and all the other Silicon Valley startups. The startup is called Udelv. This week it delivered groceries to two customers of a local store called Draeger’s Market. The delivery van drove autonomously from the store to the customers’ houses, although (as required by California law) a “safety driver” sat in the driver’s seat during the delivery. I talked to Udelv CEO Daniel Laury, and he told me the delivery was “a huge milestone.” Draeger’s Market deliveries go online to the public “next week,” according to Laury. The “milestone” Laury refers to is commercialization. He’s saying that Udelv is the first company to actually use autonomous vehicles for a service that’s paid for by a customer (in this case, the grocery store). Udelv’s model shows how autonomous deliveries could work on a massive scale. Its custom, proprietary electric vehicles are basically robotic lockers. Each van has 18 lockers that can carry a collective weight of 700 pounds. When the van gets within a few minutes of a customer’s house, that customer receives an alert via the company’s free app (currently available on iOS, with the Android version coming soon, according to Laury). Once the van arrives, customers use the app to unlock the compartment that holds their groceries. The Udelv fleet is monitored by a control room of humans, who can take over in “unique situations” and drive the vans by remote control if necessary. Udelv monetizes with a simple model. It charges companies to make deliveries. Its goal is to cut the cost of deliveries in half, according to Laury. 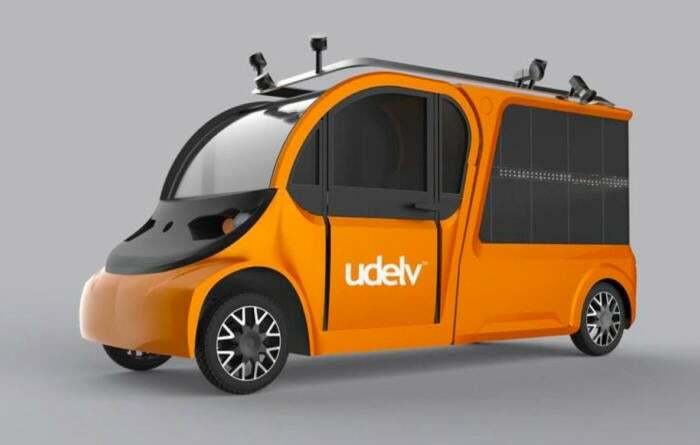 Udelv also plans to expand beyond Silicon Valley and seek out autonomous-vehicle-friendly states to set up shop in. Another interesting autonomous-delivery company emerged into partial sunlight this week. A secretive Silicon Valley startup called Nuro unveiled its electric self-driving vehicles, and they’re pretty extreme looking. Nuro’s self-driving, custom delivery vans enhance safety by being much lighter, narrower and slower than an average passenger car. Nuro vehicles are about as long from front to back as an SUV, but they’re skinny and light. Nuro vans are about 3.5 feet wide, and weigh about 1,500 pounds — a fraction of what an average car weighs. 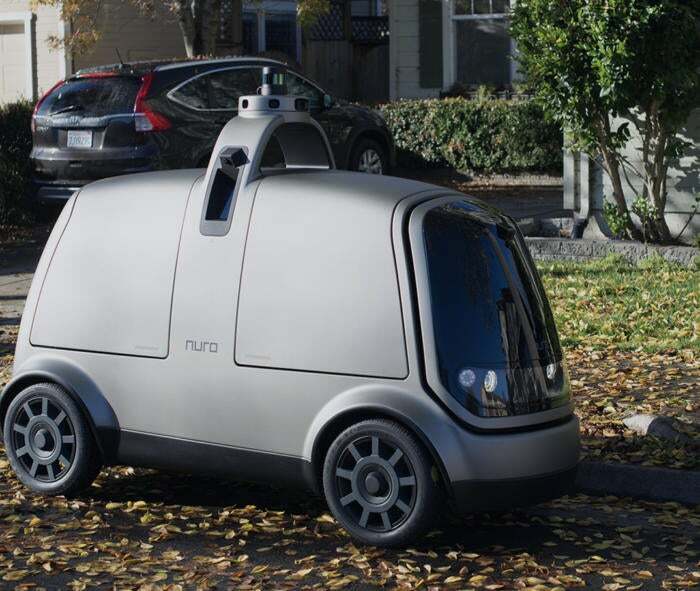 Nuro cars can carry about 250 pounds total, and they can carry a variety of things, from groceries to dry cleaning to Amazon packages. The company, which plans to be in operation no later than this year, is currently in talks with several retailers, according to press reports. The best measure of progress toward our self-driving automotive future may be the California DMV’s annual “disengagement” report. The state of California allows autonomous car and truck testing, but requires “safety drivers” — a human driver who can quickly take over the driving if the autonomous systems fail. “Disengagement” is when a human takes over. The DMV’s disengagement report year over year shows progress in the ability of self-driving cars to drive without intervention. For example, the report reveals that Waymo now averages around one engagement for every 5,555 miles driven — an improvement over 2016. However, if Waymo’s vehicles were on the same test routes and carrying passengers without a safety driver, there would be an accident or problem every 5,555 miles — which isn’t acceptable. In other words, that rate of disengagement tells us that self-driving cars are significantly more dangerous right now than cars driven by people. In circumstances where Waymo and others are actually carrying passengers without drivers, the routes are limited to tiny neighborhoods with clear street patterns that have been heavily mapped and tested by Waymo. Delivery vans can take the time to cope with road scenarios that confuse A.I. They can drive slowly, stop, take time to process the scene, even call for human help. Passengers wouldn’t tolerate these stops and slowdowns. They don’t put passengers at risk because there are no passengers. They also reduce risk for people outside the vehicles — pedestrians, bicyclists and other motorists. The reasons are that delivery vans can be slower, smaller and lighter. Nuro vehicles weigh a fraction of the weight of an average car, and they’re way skinnier. These facts reduce both the likelihood of accident (say, striking a bicyclist passing in the car’s lane) and the impact should an accident occur. They can operate at optimal times. While passenger vehicles might have maximum demand during rush hours, delivery vehicles can choose the best times for delivery. The fact is we’re at least a decade away from fully autonomous passenger cars that can go anywhere regular cars can go. But self-driving delivery vans are already serving customers. That should serve as a wake-up call to enterprises that make deliveries. The time to investigate this new technology is now. The opportunities for small, slow delivery vehicles are huge and coming fast.